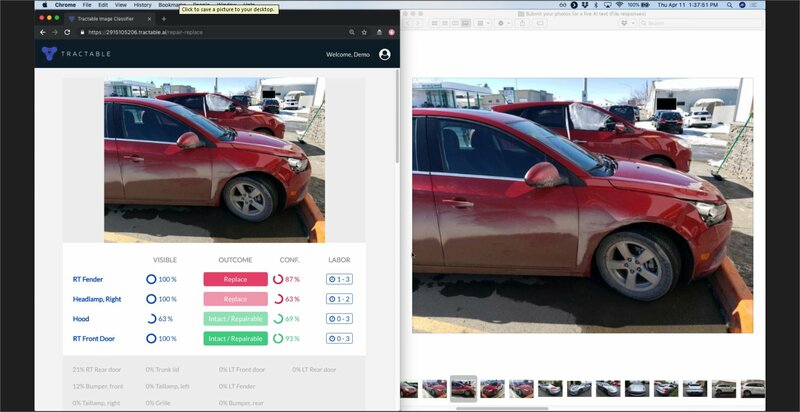 Artificial intelligence photo estimating service Tractable on Thursday tested its software on photos submitted by participants in what the company called a live demo. The company presented the audience with the artificial intelligence’s estimates of repair/replace decisions and a likely range of labor hours. It also had U.S. operations auto appraisal manager Lisa Monzon, a former adjuster for Travelers and Progressive, weigh in with her analysis of the photos on the webinar. We also were given the opportunity to submit a set of photos, which allowed us an opportunity to compare the Tractable output and Monzon’s perspective against a real-world example. 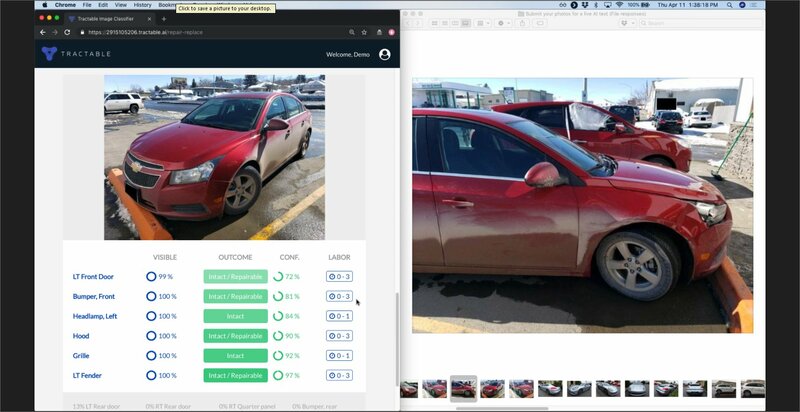 The demo selected images of a 2013 Chevrolet Cruze LT1 out of the photo sets we submitted Wednesday evening. The repairer which provided us with the photos also gave us a copy of the insurer’s initial photo estimate for the car and the shop’s own expanded estimate. The shop said the insurer agreed to the additional operations. We don’t intend to suggest a single data point in a demo is proof of anything. But we felt repairers, insurers and consumers would still be interested in the exercise as an opportunity to learn more about what the technology might and might not be able to do. 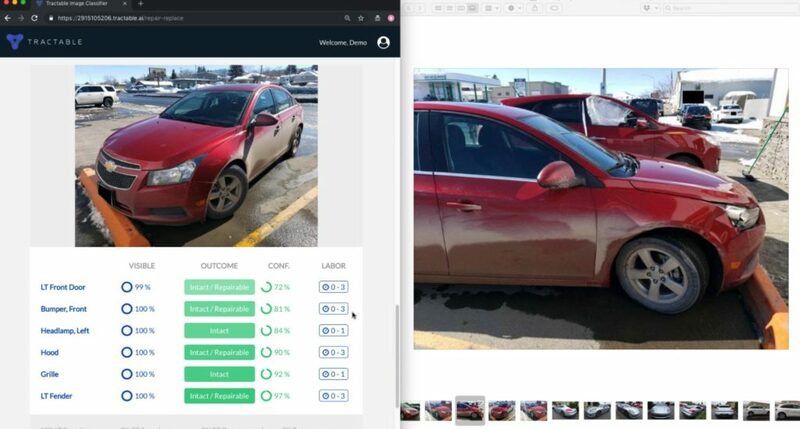 Regardless of one’s views on artificial intelligence photo estimating, it’s likely to be a reality on some auto claims in the coming years, and the market needs to understand it. For example, CCC has an A.I. 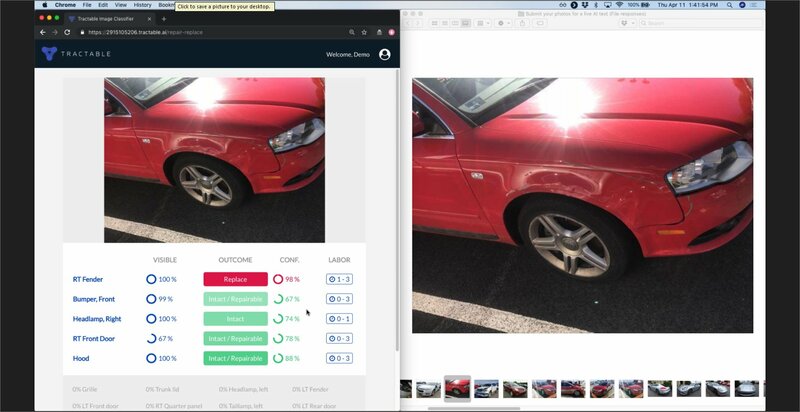 photo estimating product. Mitchell had been working with Tractable, though it ultimately ended its partnership with the startup. 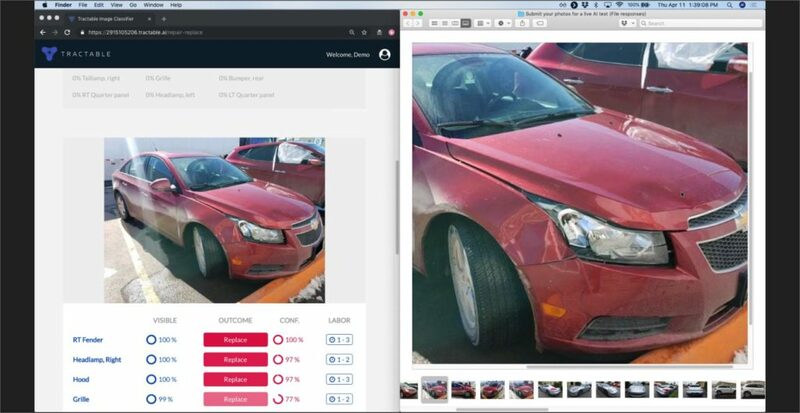 Audatex in 2017 announced a deal to partner with hail photo-estimating provider CSI. 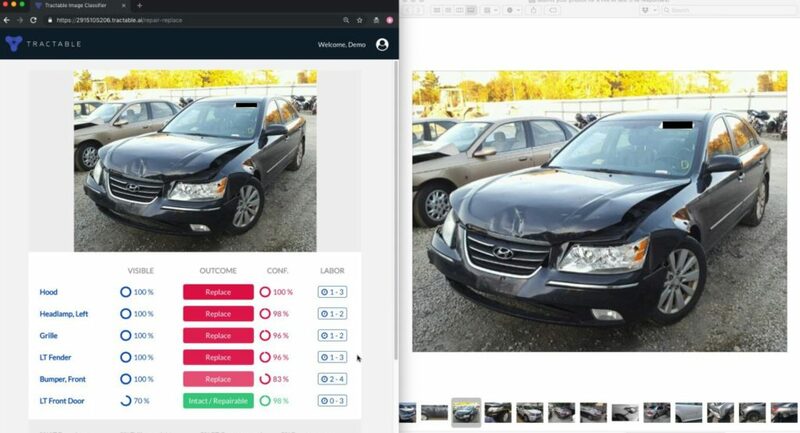 Tractable said it used a stripped-down version of its software for the demo Thursday, but it had the capability to estimate repairs in even greater depth than what we saw. 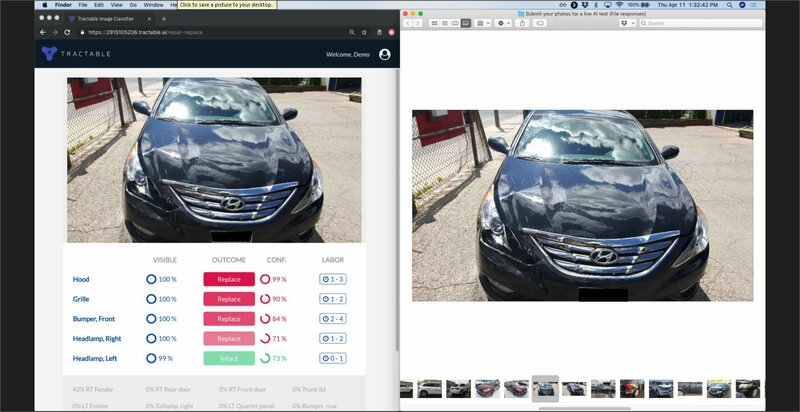 The software draws on lessons learned from past photos and estimates as well as rules introduced by human appraisers. Tractable said the A.I. could be adjusted to suit the individual user’s damage assessment criteria, which raises the question of an insurer arbitrarily cranking up the “replace” ratio to save money. 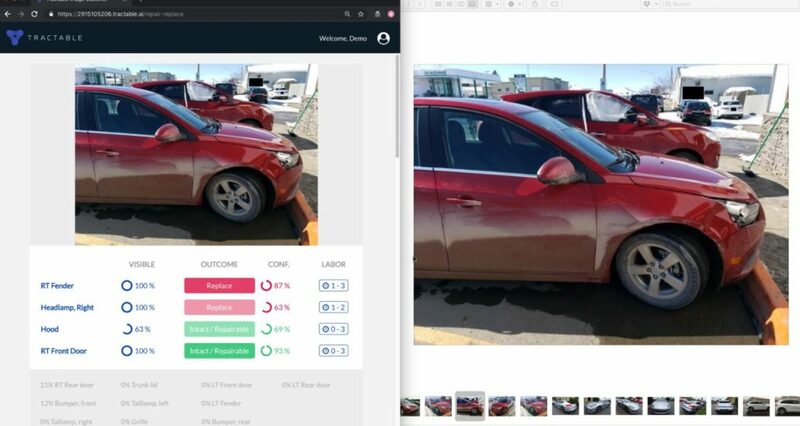 The initial 20-line human insurer photo estimate on the low-mileage 2013 Cruze called for replacing just three parts — the bumper cover, the right headlamp and fender liner — and other operations. The estimate was $1,568.80. The body shop’s 46-line estimate called for replacing the bumper cover, side retainer, headlamp, hood and fender (and an emissions label), and contained even more operations than the original estimate. Its bill was $3,981.49. Tractable’s A.I. called for replacing the Cruze’s fender, headlight, hood and grille. 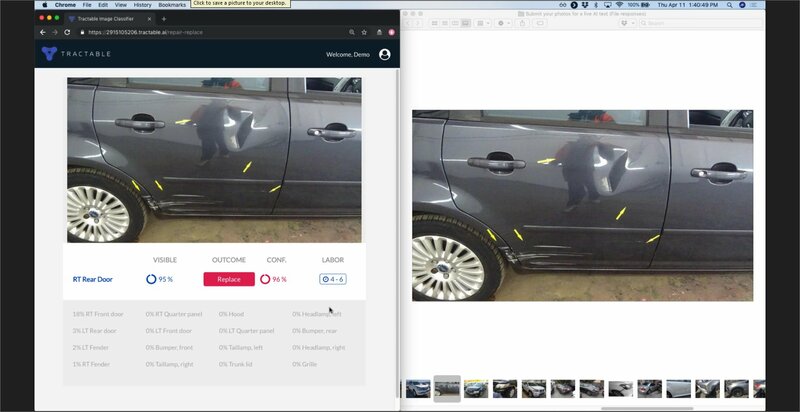 Different photo angles led to the software making different predictions of damage, not surprisingly. Monzon offered a few off-the-cuff interpretations of the Cruze photos which echoed the shop and A.I.’s assessments. She called the fender an “obvious replacement” and stated that for the hood, “replacement is the best option” for safety reasons. Tractable’s demo also spit out a range of hours the A.I. predicted for the various operations. It was unclear if these included both body and paint hours, but they appeared to be simply body labor. Tractable CEO Alex Dalyac explained that the range was meant to address what the company found to be the “notoriously ambiguous task” of determining labor hours. He said multiple experts and sometimes even different regions within the same state will estimate different times for the same operation, giving the example of receiving six-, nine- and 12-hour estimates for a single task. Here’s some of the other predictions the A.I. made on images submitted by other participants and some of the associated commentary. Since we didn’t submit these photos, we can’t tell you what the real-world estimates determined (assuming such documents exist). However, we thought shops would be interested in the A.I.’s conclusions nonetheless. 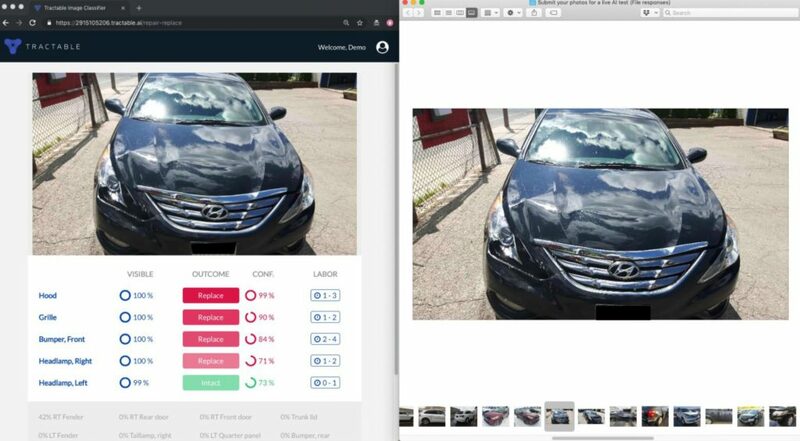 Dalyac pointed out that the Hyundai image below led to the software determining “three pretty strong replaces” — the hood, grille, and front bumper. The A.I. was fairly certain a headlamp needed to be swapped out. 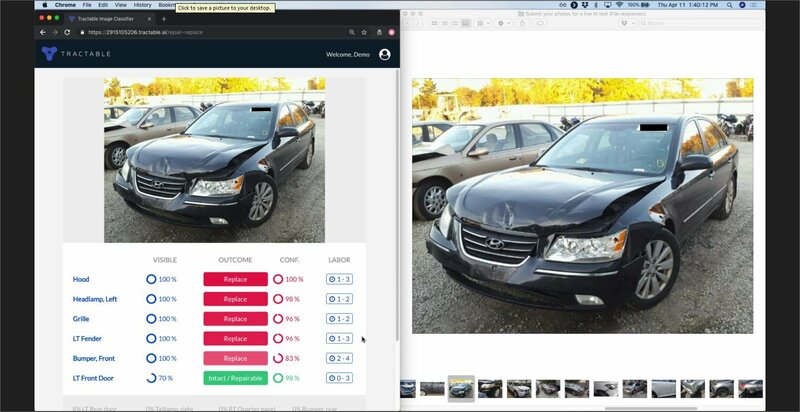 Another Hyundai image was interesting because Dalyac said it appeared to be in a salvage yard. Perhaps not surprisingly, the system calculated that much of the front end needed to be replaced. A close-up of a right rear door led to the door being deemed a replace. Monzon said the scrape looked potentially repairable, but the dent made it a replace. 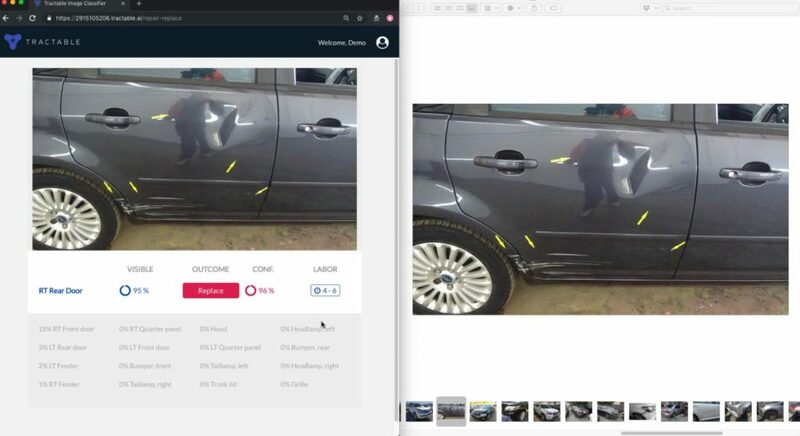 The photo failed to capture scraping on the adjacent body panel, possibly because the image was too tight to allow it to identify the broader part. 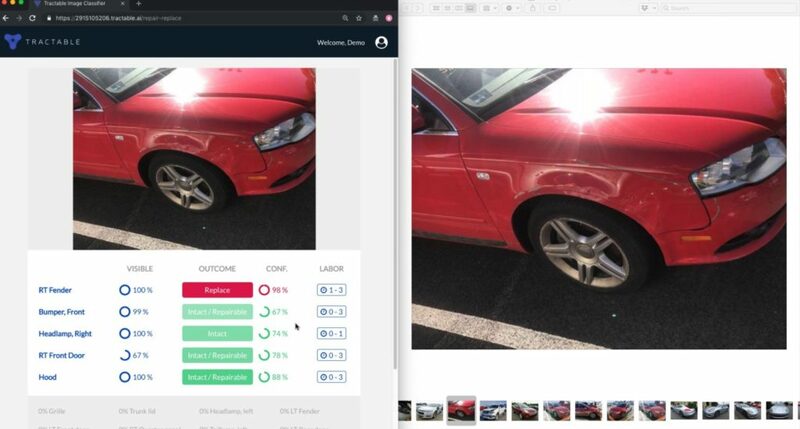 The system concluded this Audi needed a new fender but the bumper fascia could be fixed, though the latter determination carried only a 67 percent confidence level. Monzon concurred with the assessment, calling it “slight damage” to the bumper fascia which was repairable.